Homework is a central feature of Cognitive-Behavioral Therapy (CBT), given its educational emphasis. This new text is a comprehensive guide for administering assignments. The first part of the text offers essential introductory material, a comprehensive review of the theoretical and empirical support for the use of homework, models for practice, and systems for evaluating client compliance and therapist competence in administering assignments. Part two focuses on the role of homework in cognitive therapy, demonstrating successful methods of integration and discussing solutions to common barriers. Rather than offering one-size-fits-all, pre-designed tasks, this book illustrates application of a model with detailed case study and recommendations for adjusting administration methods for particular problems and specific client populations. 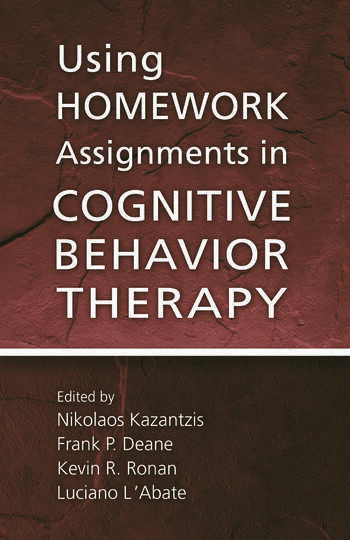 Over the last nine chapters, homework administration is described within cognitive and behavioral therapy for anxiety and depression, chronic pain, delusions and hallucinations, obsessions and compulsions, marital and sexual problems, personality disorders, children and adolescents, group and family therapy, and older adults. Readers are provided with a full range of knowledge to successfully incorporate individualized homework assignments into their practice to maximize the proven long-term benefits of CBT. About the Editors. Contributors. Part I: Theoretical and Empirical Foundations. Introduction and Overview. Theoretical Foundations. Empirical Foundations. Assessment of Homework Completion. Part II: Clinical Applications. Panic, Agoraphobia, and Generalized Anxiety. Depression. Substance Abuse. Delusions and Hallucinations. Obsessions and Compulsions. Sexual Problems. Borderline Traits. Children. Adolescents. Older Adults. Couples. Families. Nikolaos Kazantzis, Ph.D., is a faculty member and registered clinical psychologist with the School of Psychology, Massey University at Albany, New Zealand. Frank P. Deane, Ph.D., is Professor of Psychology at the University of Wollongong in Australia and Director of the University's Illawarra Institute for Mental Health. Kevin R. Ronan, Ph.D., is Associate Professor of Psychology at Massey University. Luciano L'Abate, Ph.D., is Professor Emeritus of Psychology from Georgia State University where served as Director of the Family Psychology Program and Family Study Center.